Garden fairies here on this Friday morning. How's everyone doing today? We garden fairies are doing pretty good. Oh, sure, we'd like it to rain as much as Carol would like it to rain, but we are getting by, regardless. Lately we've been eyeing the grapes which have ripened and then some. Far as we can tell, Carol doesn't seem much interested in harvesting them, so we garden fairies are going to be organizing ourselves a little harvest work group and see if we can't get to some of those grapes before the birds do. Here tell, this dry summer has been good for grape growers in Indiana, and we are determined to not let our grapes go to waste. We are going to pick them and make wine! After all, for a garden fairy, wine is a primary food group, right up there with nectar, pollen, and fresh garden tomatoes. And we need lots of fairy wine to get us through the winter. We've also been spying on some of the pictures Carol took when she was in Dallas, Texas a few weeks ago looking at all the gardens with all them other "garden communicators and writers". By the way, we garden fairies, as you can see, are garden writers, too, and we don't know why she didn't take us along, especially if there were garden fairy houses to see. We are definitely going next year. She can't stop us because that big garden writers meeting and garden touring is going to be right here in Indianapolis! But we digress. Where were we? Oh, right, garden fairy houses. The picture above looks to be a Texas style garden fairy house. It's nice enough, but we garden fairies were hoping for something a tiny bit nicer if Carol is going to go to the bother of providing us with accomodations along that order. Ha! We garden fairies can dream can't we? Regardless of whether it is a humble cottage or a grand castle, we garden faries think it sure would be nice to have some place like that to go especially when Mr. Fancy Red Fox comes around! Did you hear about that? There was a fox in Carol's garden the other evening, and she seen it with her own eyes. Oh, gosh, that was sure funny, seeing Carol seeing that fox. But on the other hand, it wasn't funny for us garden fairies, it was darn right dangerous! Ol' Tangle Rainbowfly saw the fox first and immediately sounded the alarm so everyone could hide. Miss SweetPea Morningdew nearly swooned when she heard the news, even though the fox didn't come anywhere near her. But other than that, everyone stayed calm and the fox ran off so we think we are okay for now. 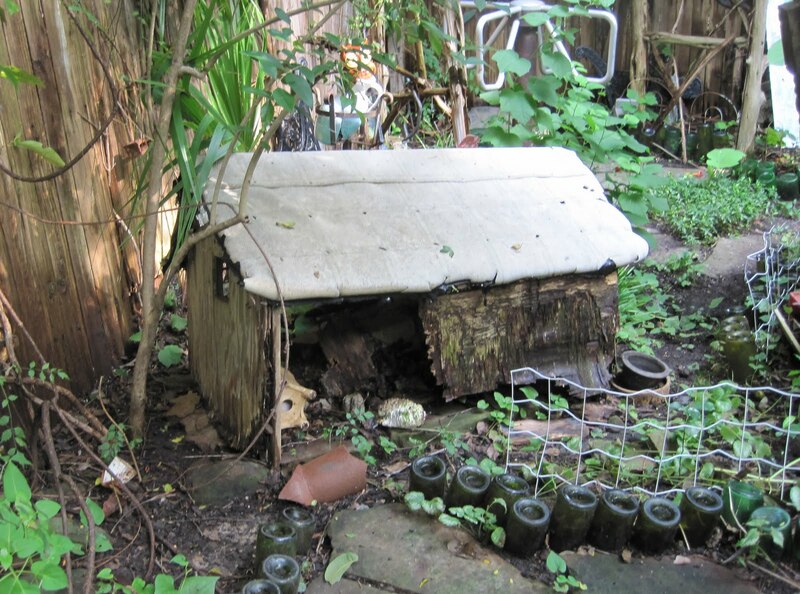 Anyway, we garden fairies would appreciate a little more shelter around May Dreams Gardens and hope that somehow Carol is going to incorporate some into her new garden design! I hope that you leave a few grapes for Carol. What with the drought those grapes should have a rich flavor just right for making jam that would taste oh so good on toast some cold winter day. It will get cold, won't it? Watch out for those foxes. Hey there Maydreams Fairies! We, your cousins in Tennessee are eyeing that castle up and down and think it would be a grand addition to the Fairegarden. Our human keeps making us these flimsy gazebo things, which are fine for summer lounging about, but something like that castle would sure keep delicate fairy toes warm in winter. Maybe we can leave Frances a hint? You do need a castle since you are doing so much writing on Carol's behalf. I vote for the one with the turrets. It should have a hidden escape route, of course and a moat perhaps. Best regards from your friends at L & G.
Our local nature center is hosting a garden faerie event this weekend and we will all be going over for some music, stories, and a look into a variety of faerie garden homes… Will have to post some pictures to share what goodies we find. I've been longing to make some places for faeries to live in my garden… Maybe after this weekend, we will get to it! I can see why you like the fairy castle. I love it too. Here's hoping Carol makes you a very nice abode once the garden design is fully realized. Kisses to the fairies. I'm glad you fairies are keeping out of reach of the foxes. Gardens can be dangerous places. A gardening friend of mine got great photos of a bobcat in her garden last week! I'll do my best to put a little bug in Carol's ear, Thorin. I think since she is going to all the trouble to re-design her garden, a modest dwelling (I vote for the second photo) for you shouldn't be too much to ask. Maybe if you leave her a little sample of your homemade wine this fall, she'll get the hint. I love that castle and am trying to work out how to build one. 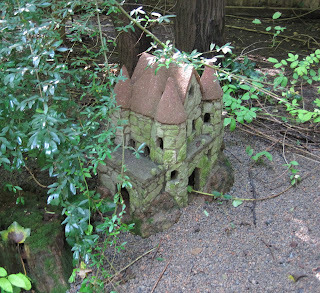 I see a lot of 'Fairy houses' on different websites but they either do not look very weather proof, or they have sealed doors and windows. Very pretty, I'm sure, but not very good for fairy folk to make a home in.